On a cold January morning, a sizzling percussive rhythm echoed from the depths of the Hall of Languages. 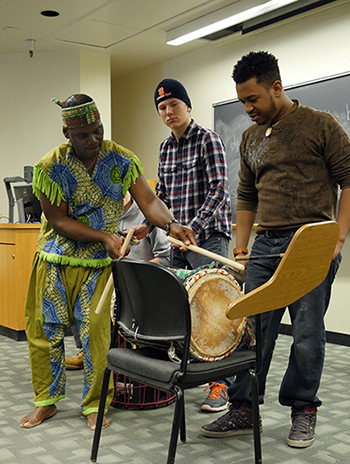 Students in Professor Carol Babiracki’s “Intro to World Music” class were treated to a vibrant African drumming and dance workshop, led by world-renowned dancer, singer, and drummer Biboti Ouikahilo. Biboti Ouikahilo demonstrates African drumming for students in Carol Babiracki’s “Intro to Word Music” course. Babiracki, associate professor of ethnomusicology in the Department of Art and Music Histories in the College of Arts and Sciences, invited Ouikahilo and a few other professional percussionists to her class to help students bridge the gap between the abstract musical concepts they have been studying and the complex cross-rhythms of live drumming. Ouikahilo is from the Ivory Coast, where he was a lead performer and teacher with the Cote d’Ivoire National Dance Company. After moving to the United States in 1997, he spent six years teaching at the renowned Djoniba Dance and Drum Center in New York City. In the early 2000s, he toured the country with Jimmy Buffet and appeared in the film “Tears of the Sun” with Bruce Willis. Ouikahilo eventually landed in Syracuse and, in 2009, co-founded Wacheva, a center for multicultural dance, drumming and fitness in the One Village dance studio building in the Westcott area. As curious onlookers gathered outside the HL classroom door, students inside surrendered to the music, actively participating with Ouikahilo’s infectious and improvised compositions. The majority of them were out of their seats, taking turns playing the various African instruments.